Oscar Winner: Best Actress, Olivia Colman. 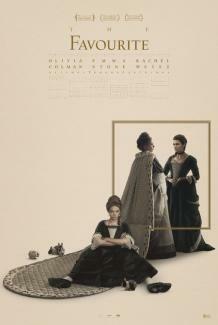 "The Favourite is a bawdy, brilliant triumph, directed by Greek auteur Yorgos Lanthimos with all the artistic reach and renegade deviltry he's known for. Olivia Colman deserves every acting prize on the planet for finding the tragicomic core of Queen Anne, the monarch who ruled Great Britain in the early 18th century, mostly from her chambers. Gout has covered Anne’s legs in leaking sores; her memory is slipping; and she keeps 17 bunnies running around the palace to replace the 17 children she birthed and lost. Her Royal Highness leaves the business of ruling to Lady Sarah Churchill (Rachel Weisz, razor-sharp and sensational), who sleeps with the queen to make sure she’ll continue to aid her husband Lord Marlborough (Mark Gatiss), out commanding the army in Britain’s continuing war with the French.